Welcome! Sharing recipes, favorite foodie links and healthy living tips - Enjoy! I threw a small butternut squash in the slow cooker this week and after one meal we had some left over cooked squash. I wanted to do something interesting with it. After some research of recipes on the web it sounded like a curried soup seemed inviting and fit the bill with what I had in the pantry. I only had 2 cups of left over squash and a 1/2 jar of unsweetened applesauce which worked out perfectly for 2 servings of soup. 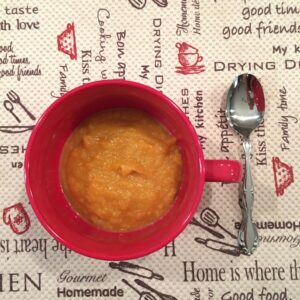 Curried butternut squash soup gets a nice sweetness to it and extra fiber from unsweetened apple sauce. You can reduce the fat added by eliminating the shredded cheese at the end. In a medium sauce pan, heat the following ingredients until pot starts to boil: stock, oil, celery salt, onion powder, garlic, bay leaf and curry. 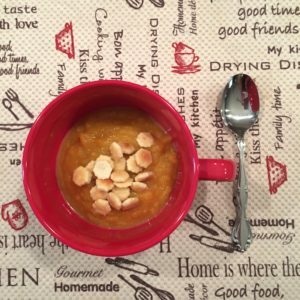 In a small mixing bowl combine squash and applesauce. Add squash mixture to boiling stock and simmer uncovered on med heat for 15 mins. stirring often. Aroma from curry should start happening soon. After 15 mins., reduce heat to low and simmer an additional 15 mins. stirring often. Remove pan from heat. Add ¼ cup shredded cheese and stir well. Using a hand mixer, blend the mixture to desired consistency on low setting. Serve immediately and enjoy! You can top with oyster crackers or additional cheese if desired.